What kind of flower is perfect to give for a summer occasion? A bloom that looks like the shining sun and encourages people to be joyful, just like summer can. If you’re looking for flower ideas for a summer birthday, housewarming gift, or just-because present, consider the sunny and summery sunflower. Want to know a bit about the bloom you’ll give, so you can appreciate how special it is or share fun facts with your giftee? Enjoy the following sunflower trivia. In addition to providing visual joy, the sunflower can satisfy in other ways. It’s a critical food source in many places in the world, because it gives off protein-rich seeds and healthy vegetable oil. Sunflowers provide tasty culinary benefits, and they offer economic stability for farmers who grow the blooms. North and South America bring us potatoes, tomatoes, corn, and sunflowers! Sunflowers from the Americas were cultivated as early as 3000 BCE, when they were used for food, dye, medicine, and oil. They were exported to the rest of the world in about 1500, by the Spanish conquistadors. Tsar the Great loved the sunflowers that he saw in the Netherlands, so he took some back to Russia. Russian immigrants to the United States, in the 19th century, brought their highly developed sunflower seeds to the Americas to grow bigger blooms than the native plants. This sparked more interest in the flower. In 1946, in Missouri, farmers began producing sunflower oil to include in many consumer products. Today, sunflower oil is a popular oil alternative to animal fats. The sunflower looks like the sun and it requires a lot of sun to thrive. Most sunflowers grow best with about six to eight hours of daylight each day, but they can certainly get more and be okay. 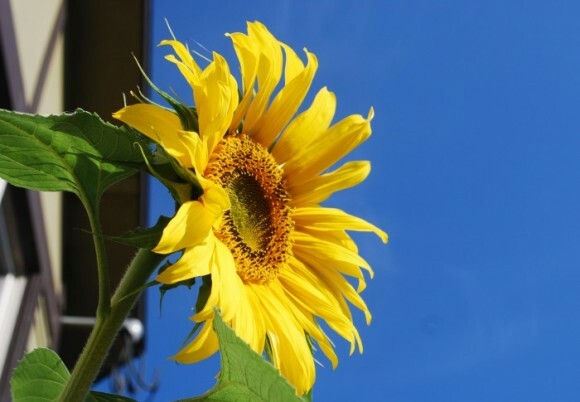 There are sunflowers that grow up to 16 feed tall! Long-stemmed sunflowers are an exquisite and special gift to give to someone during summertime.